By thrusting the whole of society into the information age, the digital revolution has fundamentally altered the way in which companies in all sectors innovate, behave and communicate. With the same disruptive power as the industrial revolution, it is changing their business models, structures, culture and management styles. The healthcare industry is facing this major upheaval too. In these times of personalised medicine, connected healthcare and quantified self, it needs to take stock of its position and review its business model. It will have to make adjustments in order to respond to those new to the sector, such as Start-ups but also Big Tech companies and major players on the internet, attracted by the convergence of the well-being, prevention, care and medication industries. There is even talk of the uberisation of healthcare! Patients, too, have evolved from passive beings into individuals who play a full role in their care pathway, demanding a greater degree of involvement, responsibility and knowledge sharing. With that in mind, value creation in the healthcare sector no longer relies solely on medication or medical devices, but on the services and solutions that surround the treatment, too. Indeed, digital technology generates genuine opportunities for innovation in healthcare services and advances. Opportunities to be seized by the pharmaceutical industry, as well as the medical equipment industry. 97.5% of healthcare industry stakeholders think that digital technology is a strategic issue for them. Xerfi Precepta estimates the eHealth market at €2.4 billion. In France, it is expected to grow by 4-7% per year by 2017. 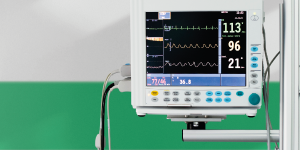 The connected medical devices market is expected to be worth $33.5 billion in 2019. Between one third and one half of the annual worldwide economic impact of the internet of things will focus on the healthcare sector in 2025. 38,000 people in France have a connected implanted cardiac rhythm management device. Savings gained from connected cardiac implants amount to €315 per patient, per year. In practical terms, how is digital technology revolutionising the healthcare industry? In France and all over the world, digital technology is seen as a real opportunity for pharmaceutical laboratories and medical device manufacturers. The pharmaceutical industry is faced with reconsidering its traditional business model that is based on its blockbuster drugs. It is, therefore, being forced to rethink its position in relation to all stakeholders in the healthcare system, including patients. At a time of debate on regulation of healthcare expenses, of publication of reports on the proper use of medication and of heightened interest in prevention, the pharmaceutical industry is being encouraged to take on a new role as service provider and health promoter. Digital technology is, therefore, becoming a new area of innovation, particularly in terms of prevention and therapeutic education, but also, in addition to therapeutic solutions, to offer related services designed to improve provision, monitoring or coordination of care. The digital revolution could also very quickly impact the organisation of laboratories from the point of view of research and development. The use of Big Data techniques should basically mean that they can optimise the processing of data collected during the phases of clinical trials to develop models to predict the physiological effects of compounds and so speed up their development. But digital technology may also make it easier to recruit patients for these clinical trials and for hospitals, research institutions and even funding bodies to collaborate on new research programmes. A similar logic applies to the medical equipment companies. The squeeze on healthcare expenditure means they have to develop connected medical devices. At the same time, the spread of quantified self solutions means that these new devices are more readily accepted by patients. The underlying idea is, of course, to foster a continuum of care in which the patient has the benefit of care over the long term and not just during the acute phases of their illness. This could prove particularly appealing to patients with chronic conditions who have to manage their illness on a day-to-day basis. They have the advantage of daily support and their care team can fine-tune their treatment in the light of more plentiful and more precise data. 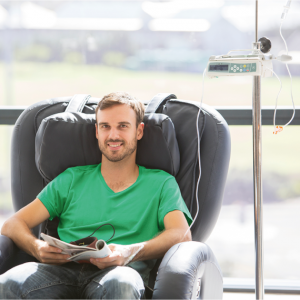 Orange Healthcare is helping the healthcare industry face this major revolution. We use our expertise in methods of communication and integration to help the implementation of simple, reliable and effective solutions. 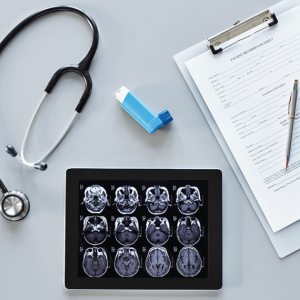 Our knowledge of the world of healthcare means we can offer products and services that fulfil the requirements of the sector, particularly where the security of healthcare data transmission and hosting is concerned. Specialists from Orange Consulting are also available to assist those within this sector with input to and the implementation of these innovative projects which sometimes affect their organisations as a whole. These days, our healthcare system still focuses on managing illness rather than on managing health in general. Yet, the situation is changing, due to the fact that the patient is becoming a genuine stakeholder in their own health, the current national thinking on setting up pathway medicine and the emergence of what is known as quantified self. Intelligent scales that register your body mass index, T-shirts that record your heartbeat, socks with temperature and pressure sensors, toothbrushes that analyse your brushing technique, and so it goes on. These are all modern gadgets that could, in the future, be of benefit to the health pathway of each and every one of us. In the United States, it is now common to see patients taking charts of their sports performance or weight fluctuations when they go to see the doctor. Or doctors who are themselves increasingly willing to recommend devices that help them to make a better diagnosis (nearly half of healthcare professionals would recommend internet sites or applications to their patients). Is this relevant? Is the data provided relatively reliable? Will we overwhelm our healthcare professionals with a wide variety of different data? Obvious questions are now being asked and there is still a wide gap between the connected medical devices that have been accredited and regulated and those that are still considered gadgets. However, it is undeniable that by encouraging those that have them to change their behaviour, these tools are already combating sedentary lifestyles and could, therefore, be worthwhile for the purposes of prevention. In some cases, monitoring simple indicators, such as weight, can also contribute to enhanced medical monitoring. In Auvergne, the Cardiauvergne system that is based upon monitoring weight, and also upon nurses uploading clinical symptoms on a weekly basis, has obtained extremely encouraging results by reducing the death rate and number of readmissions to hospital in heart failure patients. Means “connecting” objects to a wider network, whether directly through the user’s smartphone or using communication protocols of their own, making it possible for the objects to communicate with each other. It consists of adjusting treatment to suit the characteristics of the patient and their illness. Specifically, it involves conducting a diagnostic test on the patients to predict those for whom the treatment will be most beneficial, and those whom it will not benefit at all. Therefore, it is offering the right treatment to the right group of patients at the right time. This term, which emerged in California in 2007, is used to mean that practice of “self-measurement”, which consists of knowing yourself better by measuring data relating to your body and your activities. Also known as “self-tracking”, which means the practice of collection, analysis and sharing of personal data. A medical device is any instrument, apparatus, appliance or software intended by the manufacturer to be used for human beings for the purposes, in particular, of diagnosis, prevention, control, treatment or alleviation of a disease or an injury.